I first had lemon risotto at our favorite local Italian restaurant, Enzo’s. It was one of the best risottos I’ve ever had, so rich, creamy and simple. I just used my basic risotto recipe and added lemon zest and peel. It’s really easy, and was also a perfect substitute to my son’s favorite macaroni and cheese. 1. Bring chicken stock to a simmer in a saucepan. Preheat a large skillet. Drizzle with olive oil and add onions, garlic and rice. Stir and add additional olive oil until every grain of rice is completely coated. Saute for about 5 minutes, or until the edges of the rice start to turn translucent. 2. Add vermouth or white wine and stir. Let the wine be absorbed. Add 1 ladle of warm chicken stock and stir until all liquid is absorbed. Stir well and let it sit over a very slow simmer until the liquid is absorbed, and then add another ladle of liquid and stir again. Continue this process until all the liquid is absorbed. 3. When rice is done, it should be al-dente, add cheese and stir well to melt and mix in. Add lemon juice and lemon zest. Mix well. Serve immediately garnished with freshly chopped Italian parsley. I love lemons. I love risotto – This looks amazing!! I will definitely be giving this one a try! Fancy something a bit different for dinner? 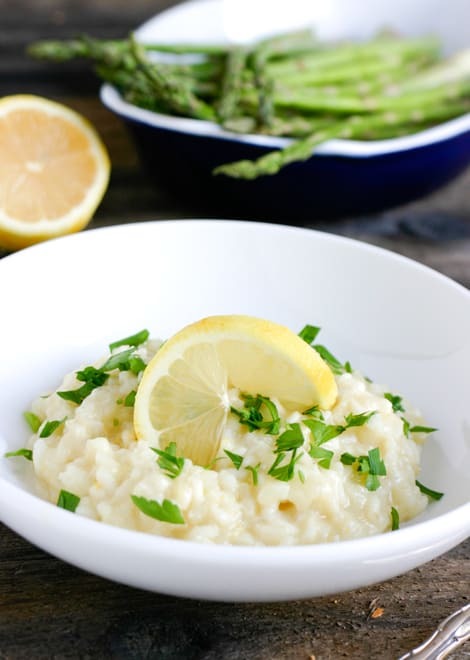 Try this Lemon Risotto recipe from @EclecticRecipes http://bit.ly/eOhlNB – looks delicious! I bet that this risotto is so bright and fresh, something that a lot of risottos seem to lack in recent months. Looks great! Bas﻿eba﻿ll was made for kids, and grown-ups only screw it up.